As manager of a tree farm in the Missouri Ozarks, I was struck by the irony of selling quality hardwood logs on the stump for 1/10th the cost of the warped, knotty pine at the retail lumber yard. When I first considered setting up a sawmill of my own (30 years ago), options were limited to circle mills powered by everything from farm tractors to old cars jacked up with a drive belt wrapped around the rim of a wheel (this is the Ozarks, after all). My solution was to cut the logs, and haul them to a local sawmill where they were milled into lumber for the home I was building. For two years, he conducted intensive research and development – he invented novel designs and adopted innovative technology. 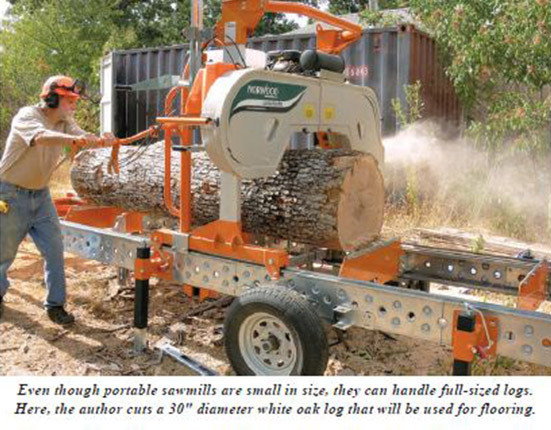 With the first Norwood LumberMate, a revolution in portable sawmilling was born. Faced with the same dilemma, Peter Dale took a much different approach. He designed and built his own band sawmill from the ground up. It took two years of experimenting and inventing to come up with a mill that was strong, accurate, and reliable enough to suit him. After thoroughly testing it out during the building of his house, he realized that the mill would appeal to others, and went into manufacturing it as the Norwood LumberMate. Although he had created an excellent sawmill, Peter continued to refine it for maximum productivity, strength, efficiency, safety, and versatility. Now, over twenty years and nearly fifty patents later, Peter is even closer to his vision of the ultimate portable band sawmill. Norwood Sawmills manufactures sawmills ranging from the 9 h.p. LumberMate LM29 mill capable of cutting logs up to 29" diameter to the 23 h.p. LumberPro HD36, with a 36" diameter capacity. There is no practical limit to the length of log either of these mills can handle, since track extensions are available. Some stationary Norwood mills have been extended to 40’ or more in length, in order to slice up beams, bridge timbers and trailer decking. The mills use thin kerf technology which makes a 1/8" thick cut, which produces less than half the sawdust and up to 15% more lumber from each log, which amounts to a free log for every seven cut. The band saw mills are fuel efficient, as well. The 23 h.p. Briggs & Stratton engine uses less than three gallons per 1,200 board feet—a good day’s production for one person running a manual saw mill. 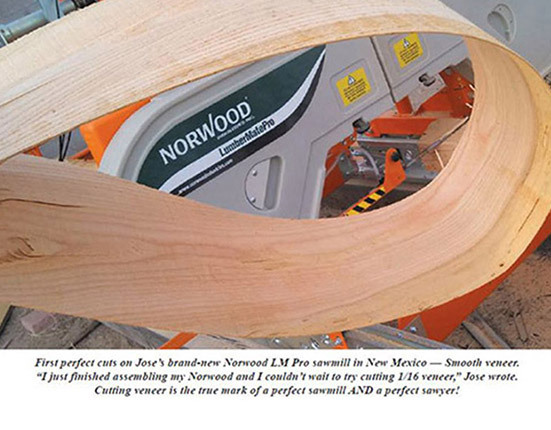 Norwood offers both manual and hydraulic band sawmills. Manual sawmills provide power only to the blade, which means the sawyer (and assistant, if available) loads and turns the logs, sets the board thickness, and feeds the blade through the log by hand. While this requires some physical exertion, experienced sawyers learn to minimize the effort, using a cant hook and, on larger logs, ramps and a winch. The advantage of the manual mill lies in its low cost and simplicity; with only a few moving parts, it is easy to maintain and repair. For more production with less effort, hydraulic sawmills use the engine to provide the muscle for all the log handling with the push of a lever. Another unique aspect of the Norwood sawmills is that the owner builds the mill from a kit, which arrives on a 4’ by 6’ pallet (including the track). This has three advantages. First, it keeps shipping costs down—very important for a sawmill that might be shipped anywhere in the world. It also keeps down the purchase price, since it saves the cost of building the mill at the factory. Third, the sawyer knows every nutAuthor Dave Hoyt Using the Norwood Sawmill Band Mill and bolt, every adjustment, and every control on the mill before cutting the first log. The pieces are self-aligning as they bolt together, and in a day and a half, the mill can be ready for action. Band sawmills are surprisingly easy to learn to use. Most beginning sawyers find that it takes three or four logs to get to the point where they produce consistent, straight lumber. Every log, however, presents its own challenges and teaches its own lessons. With experience, you will learn to “read” the log. For example, offcenter growth rings indicate that the log came from a leaning tree and likely has stress in it. Bumps in the bark indicate grown-over knots that may be difficult to cut. And blue stain in oak comes from a reaction of tannic acid in the tree with iron—an almost sure sign that there are nails or other metal embedded in the tree.